Acura conducts research, development, laboratory, manufacturing and related activities for product candidates utilizing AVERSION® Technology at the Andrew D Reddick Research & Development Center located in Culver, Indiana. This facility was dedicated in October 2011 in memory of our previous President & CEO, Andy Reddick, who passed away in April 2011. 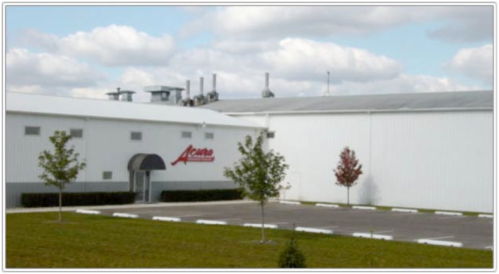 The 28,000 square foot facility is registered with the Drug Enforcement Administration (DEA) to perform research, development and manufacture of certain DEA-scheduled active pharmaceutical ingredients and finished dosage form products. We obtain quotas for supply of DEA-scheduled active pharmaceutical ingredients from the DEA and develop finished drug product candidate dosage forms in our Culver laboratories. Acura manufactures clinical trial supplies of drug products in our Culver facility in volumes sufficient to meet US Food and Drug Administration standards for New Drug Applications and expects that commercial manufacture of our products will be performed by our licensees or other qualified third party contract manufacturers.